Life Science Conferences and Twitter: What Factors Lead To Better Engagement? 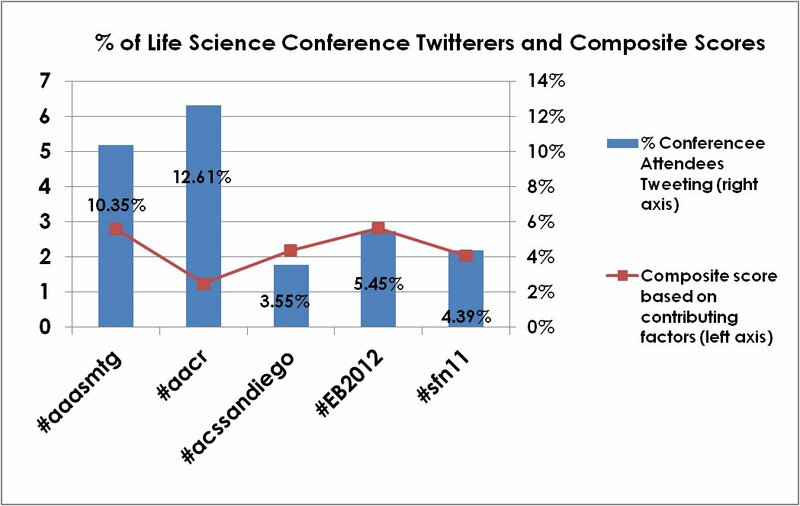 It’s been about nine months since we did our initial report on the utilization of hashtags at life science conferences. Now that the spring 2012 conference ‘season’ is almost over, we wanted to look at Twitter conversations tracked by the hashtags for each event. By tabulating the number of Twitter status updates and comparing it to the total number of attendees, we find that between 3.5 and 12.5% of life science conference attendees Tweet about the event. Here we discuss the trends and factors which affect life science conference Twitter engagement with an eye towards improving communication, resulting in a better experience for all. We judged the amount of Twitter activity by looking at the number of attendees, the number of status updates or Tweets, and number Twitterers for five of the major life science conferences since November 2011. Some meetings (ASCB, SLAS) were not included in the analysis because their Tweet volume was much smaller. Additionally, conferences for the ‘uber engaged’ scientists such as ScienceOnline were not included as their stats would dwarf that of the ‘mainstream’ conferences. The results of these tabulations are shown in the table below. For AACR, we adjusted the number of Tweets due to the fact that there is not a separate hashtag for the conference. We estimate that there are approximately 500 Tweets a month that are generic for the association, and removed them. We then counted the Tweets for a year, as we found that the conference is discussed almost year round. Of the five conferences we studied, AACR and AAAS had the highest percentage of attendees Tweeting (with the caveat that we cannot determine whether who is actually attending the conference). We also looked at qualities which we think encourage Tweeting at life science conferences. Firstly, we looked at whether conference hashtag was displayed prominently on the website. In some cases, it was listed on the home page, and we found that all of the conferences except #EB2012 listed the hashtag (in contrast to conferences that didn’t make this list). We then looked at which conferences had ‘official’ bloggers listed, with the thought being that many science bloggers are also on Twitter and both they and the conference organizers would encourage Tweeting. This individual fact did not appear to have an effect on the percentage of Twitterers. Interestingly, we’ve found that conference Twitter conversations are becoming more technical, perhaps because attendees opt to microblog rather than to blog. We think this may result from the fact that a scientist’s blog theme likely doesn’t always fit the topic of the conference, and they haven’t an opportunity to blog elsewhere. Perhaps if more conference organizers supported bloggers, and provided a blog to publish their posts, the Twitter volume would actually decrease, but there would be a more lasting documentation of the event. The existence of an ‘official’ conference Tweetup also did not correspond to an increase in Twitter activity either. The final factor for engagement that was considered was the ‘tightness’ of the Twitter network as judged by the percentage of Tweets that represent conversations, in other words direct replies beginning with “@.” Again, this raw number did not correlate in itself to the differences in the percentages. However, when we created a ‘composite score*’ of all of the activities each conference organizer employed, we found a rough correlation between the composite score and the percent of conference attendees Tweeting, see the graph below. The correlation seems highest for #acssandiego, #EB2012, and #sfn11 (please excuse the number of significant digits for this quick and dirty analysis!). Additionally, factors such as the computer savviness of the attendees, the topic, and the presence of online science thought leaders all weigh in on the utilization of Twitter to communicate at conferences. We plan to dive deeper into the Twitter networks that form at life science conferences and the influencers that lead the conversations. These analyses are not only important to help improve adoption of Twitter at conferences, but they help our clients, life science companies, understand how best to reach scientists online. Life science companies can support conferences by informing their customers of their hashtags and other clever promotions involving Twitter. We provide Social Media Compass reports for most of the hashtags we track on this list (which also contains all the stats used in this post), contact us to learn more. We applaud the conference organizers and participants represented in this study and hope that these studies will lead to all involved getting more out of each event. *Composite score sum calculation: 0 or 1 was given for ‘No’ or ‘Yes,’ respectively, for the conference blogger and organized tweetup factors. For the hashtag listing factor, 0, 0.5, or 1 were given for ‘no listing,’ ‘subpage listing,’ and ‘home page listing,’ respectively. The percentage of direct replies was divided by 10 (e.g., 0.75 for 7.5%). Special thanks to David Shiffman aka @WhySharksMatter for tabulating some of the data used for this post! Interesting spread of results and lack of obvious correlations. What about unofficial tweet ups – I might argue that for societies like AACR, with low-ish “composite scores” who aren’t that interested in social media surrounding the conference, that if attendees arrange them informally (like I did in 2011) that the tweeters are likely to be more highly engaged than average….in which case, maybe official direction isn’t really needed. Also did you see that as a result of MDs using twitter around the ASCO meeting, there has been a recent paper quantitating some of these types of statistics too. Here’s the article – http://jop.ascopubs.org/content/8/3/173.abstract. If you’re interested in the whole thing I can send it to you.